Seed cones of Engelmann spruce (left) and white spruce (center). 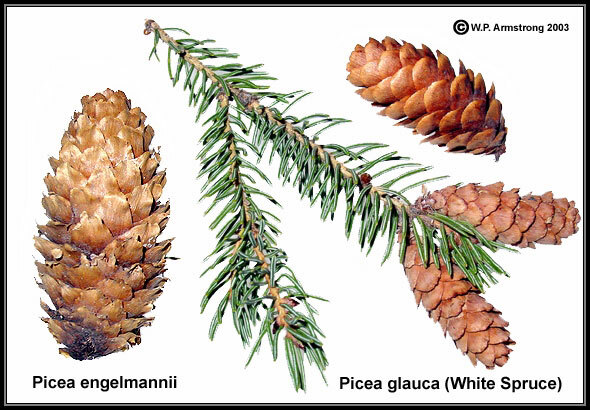 The cones of Engelmann spruce (Picea engelmannii) are larger than white spruce (P. glauca). In addition the cone scales of Engelmann spruce are more ragged, while those of white spruce are smooth and rounded like a thumbnail. The white spruce branch in photo has a small gall (called a pineapple) at the tip. An older spruce gall is shown in the upper right. Spruce pineapple galls develop on the swollen, needle-bearing branchlets of Engelmann spruce, white spruce and Colorado blue spruce (P. pungens) in Montana. The galls are caused by an aphid-like insect (Adelges cooleyi) of the order Homoptera that invades the needle-bearing branch tips. In California, this insect also attacks the sitka spruce (P. sitchensis), weeping spruce (P. breweriana) and several cultivated trees, including the oriental spruce (P. orientalis) and Norway spruce (P. excelsa). The tiny insects escape from the galls through lip-like slits above each needle. This insect has a complex life cycle that involves two genera of host trees, including several species spruce (Picea) and Douglas fir (Pseudotsuga meziesii). The winged females fly to nearby Douglas fir trees where they lay eggs on the needles. Several generations of cotton-like woolly aphids are produced. Late in summer, some of the woolly aphids develop wings and fly back to the spruce trees to deposit eggs, which produce the overwintering population. Other wingless aphids remain on Douglas fir trees where they also produce overwintering forms. No galls are formed on the Douglas fir trees. According to D.J. Borror and D. M. Delong (An Introduction to the Study of Insects, 1964), only female generations are produced, a phenomenon known as parthenogenesis. Swarming masses of these minute insects may be observed in northern Montana during late summer and fall. Seed cones of Engelmann spruce (left) and white spruce (right). The cones of Engelmann spruce (Picea engelmannii) are larger than white spruce (P. glauca). 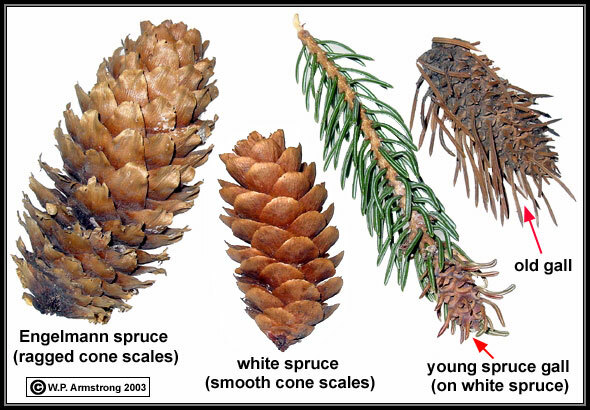 In addition the cone scales of Engelmann spruce are erose (notched), while those of white spruce are smooth and rounded like a thumbnail. 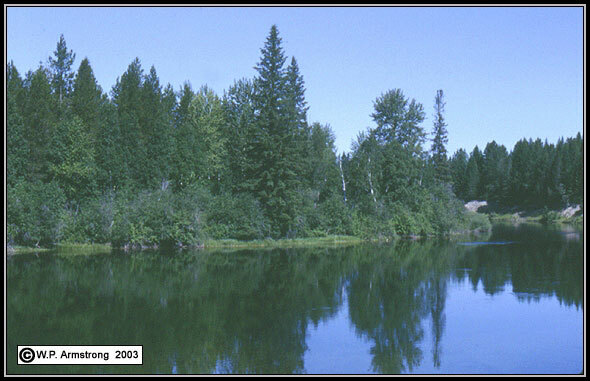 White spruce grows in northern Montana along rivers. It extends northward into Canada, where it generally replaces Engelmann spruce north of Alberta. Where their ranges overlap, these two species often hybridize. White spruce (Picea glauca) along the Swan River, near Bigfork, Montana. The following information about the uses of spruce comes from L. Kershaw, A. MacKinnin and J. Pojar (Plants of the Rocky Mountains, 1998). Spruce beer was a very important beverage to prevent survy among early travelers in the north. The crew of Captain James Cook (1728-1929) received a ration of spruce beer every day. Native Americans mixed white spruce pitch with fat to make salves for treating skin infections, insect bites, chapped hands, cuts, scrapes, burns and rashes. The pitch was also applied directly to wounds, and the young growth was boiled to make an antiseptic wash. Dried, gummy pitch was chewed, and boiled pitch was taken like cough syrup, to relieve coughs and sore throats. Melted pitch was used to caulk canoe seams and to stick sheets of birch bark or strands of willow bark twine together. It was also used to preserve and waterproof strips of hide (babiche) in ropes, snares and snowshoes. Fresh or soaked white spruce roots were peeled and split to make cord for stiching canoes and baskets and for making fishnets. Split roots were also woven into water-tight bags for cooking. Lumps of dried pitch were sometimes chewed like gum, which was said to keep the teeth white.